The Broadside of Boston - ZineWiki - the history and culture of zines, independent media and the small press. 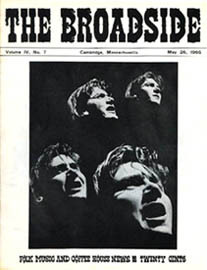 The Broadside of Boston was a fanzine devoted to folk music. The Broadside of Boston, founded in March of 1962 by David Wilson was first published in Boston, MA, moving across the river to Cambridge, MA, U.S.A. that Fall. Broadside, as it was commonly known, began as a three page hectographed publication. Subsequent issues were produced using Itek masters and then photo offset. During its existence each issue averaged 20 pages though a few had as many as 40. There is some dispute as to whether the publication is/was a fanzine but the most amazing aspect of this publication is that it lived and flourished for the better part of a decade entirely produced by a group of volunteers who received little in the way of rewards other than their name on the masthead. Some served for an extended period of time contributing time and talent that were counted as precious commodities in their “day jobs,” and never begrudged the value of their efforts. Others served for lesser periods of time, often in roles far beneath their capabilities, yet nonetheless essential to the meeting of deadlines, the preparation of copy and camera ready layouts, the servicing of subscriptions and the delivery of issues to final distribution points. Many gave of themselves to do grunt-work simply because they saw things that needed to be done and proceeded selflessly to do them. I cannot imagine a more appropriate definition of a fanzine. By the end of 1962 it had acquired the subtitle, "Boston's Folk Music and Coffee House News" In May of 1963, Wilson passed the editorial helm to Lynn Musgrave while he took over the management of a local folk-music coffeehouse although he continued to contribute a column to most issues.. When Lynn was recruited to edit a national folk Magazine, Jill Henderson stepped up to be the editor. Dave Wilson returned to the editorial helm in April of 1964 and remained as such for Broadside’s lifespan. The last 11" X 8.5" sized issue, Vol. 6, No 16, appeared in September 1967, at which point changed to a tabloid format which allowed for the addition of color and the more economical web printing production cost. Broadside featured artists such as Eric Andersen, Joan Baez, Margaret Barry, Maybelle Carter, The Chambers Brothers, The Charles River Valley Boys, The Clancy Boys, Judy Collins, Barbara Dane, Bonnie Dobson, Bob Dylan, Ramblin' Jack Elliot, Mimi Farina, Geula Gill, Michael Gorman, The Grandison Singers, Woody Guthrie, The Holy Modal Rounders, John Hammond, Jr., Sam "Lightnin' " Hopkins, Mississippi John Hurt, Ian and Sylvia, Grandpa Jones (louis Marshall Jones), Jim Kweskin, Mel Lyman, Joni Mitchell, Phil Ochs, Odetta, Tom Paxton, Jean Redpath, Fritz Richmond, Pete Seeger,Mark Spoelstra, Buffy Sainte-Marie, Dave Van Ronk, Jackie Washington,Hedy West, and Marion Williams, all featured on covers of various issues. Featured in the pages of The Broadside of Boston was club news and performance dates, announcements of festivals, such as the Newport Folk Festival. The cover of Vol. II, No. 8 featured photos from six coffee houses in Cambridge and Boston: Cafe Yana, Club 47, Club Jolly Beaver, The Loft, The Orleans, and Turk's Head. Articles included "Brandeis Folk Festival", "Folk Music Plays Huge Part in the 1963 Boston Arts Festival", "First Asheville American Folk festival Being Held", "Jackie Washington Records Third Album" and a feature on Peter Walker's Folklore Center at Harvard Square. Also included were words and music to songs by Mark Spoelstra, Eric Andersen, Tom Paxton, Phil Ochs, Dayle Stanley and others. Contributors included Ralph Earle, Ed Freeman, Bob Jones, Robert J. Lurtsema, Dave Mason (Coup), Cori Randle, and Phil Spiro. Recurring columns included Holy Modal Blither by Peter Stampfel, and Ramblin' Round by Dave Wilson. Art work was contributed by Omar. Photographs were by Rick Sullo. Letters came from Mel Lyman, and Mark Spoelstra, among others. The Broadside of Boston was one of a handful of fanzines devoted to folk music that were published in the 1950s and 1960s, along with Canada's Hoot, Sing and String, and Singalong! ; the U.S.A.'s Caravan, Gardyloo, The Little Sandy Review, The Songmakers Almanac, and Tune Up; and Folk Scene in the UK. This page was last modified on 2 July 2018, at 12:38.